Figuring out motivating classroom management strategies for older kiddos can be quite a challenge. We had practiced our procedures endless times toward the beginning of the year, had anchor charts hanging as a reminder of our classroom routines, and many, many discussions on what the expectations were. But I was still needing something more to really help us perfect some procedures we were struggling with. I had seen several teachers post about using a game like this (shout out to Ms. Bertels!) and had seen other variations of this game with whole brain teaching (happy face/sad face). My students are highly competitive…as am I…so I figured we would give this a try. First, I decided on three key behaviors that I wanted to enforce with my students: coming in and working right away, raising our hand to speak, and listening respectfully when others are speaking. Were there other things we needed to work on? Most definitely! But I decided to make these my focus. I highly suggested only targeting 3-5 behavior at a time…and 5 is pushing it. Once students mastered those three things, I could easily go back in and change them to new target behaviors. I created a point tracker for each of my 5 classes. I hot glued magnets onto the back of each on so they could easily stay on the board when not in use. I elected a student from each class to be in charge of tallying points. Whenever I saw students following the targeted behaviors, I would announce “student point.” When the rules were not being followed, I would receive a point. Sometimes there was a prize for beating the teacher, sometimes winning was the prize! I usually check the point totals at the end of each week, but you could definitely keep this going for an entire 6 weeks or even a whole semester! I would say the younger the kiddos, the shorter the time frame. You also want to make sure you keep the score close! This keeps students from just giving up. Everything about this class management game is totally flexible to meet the needs of your students and your classroom. 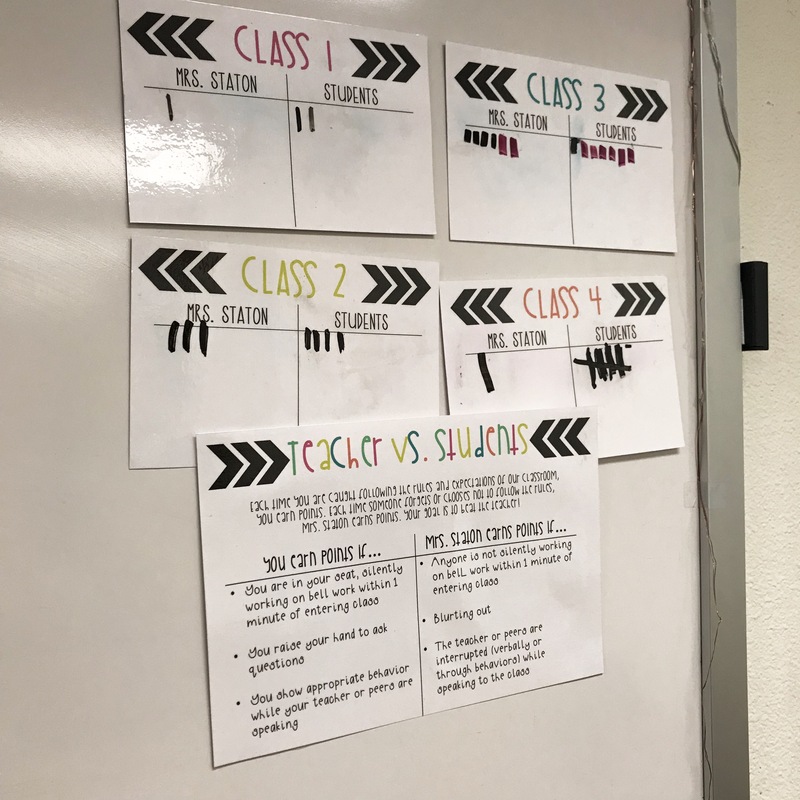 You can find a PDF version and editable versions of the teacher vs students class management game by clicking on these links! I would love to hear if you plan to use this strategy or what other classroom management suggestions you have! I’ve been looking for something like this for weeks! Thank you for all you do!!!! I live this and wel work to implement this coming week. What did you use as a class reward when you had them? I love this! I’m going to implement this this week. what did you use as a class reward when you did use it? Sometimes I would pay class money, sometimes they would get 5 minutes talk time, or a jolly rancher! Usually nothing big or time consuming! They just liked winning! Thank you so much for sharing! I can not wait to try this tomorrow!! I hope it goes well!! What did you do when you won? Was there a consequence, or just the fact that they lost and didn’t get a reward? I just bragged that I beat them 🙂 haha nothing major! There wasn’t an extra punishment. Loosing to me was enough! This is awesome, I was looking for something new to introduce tomorrow for our first day back after winter break and stumbled upon this. This is perfect! Thanks! awesome! Hope it works well for you! Would you mind sharing what font you used so that I make the sure both sides match? Absolutely! They are fonts from Miss5th. They can be purchased on TPT. The title is BBPawneeFoRever. Teacher vs Student and the rules are in BBMissShea. Hello! I can’t seem to find the editable version. I click on the link and it brings me to google slides but then it says that it is unable to convert. Can you help me with this by any chance because this is perfect for my middle schoolers! Thank you so much! Hmmm.. I’m not sure why that is happening. Everything looks okay on this end as far as the file being where it should be and linking correctly. I’m so sorry I can’t be of more help! If you email me at willteachfortacos@yahoo.com I can try to send you the file that way! I love this idea and it does not focus on individual students! I can’t wait to implement this in my classroom.